Tuesday was a travel day so Wednesday (today) is the first chance I’ve had to write. I’ll show a couple highlights from my trip to Grand Rapids AQS Quilt Week. And thank you, thank you to all of you who attended the show and shopped in my booth. 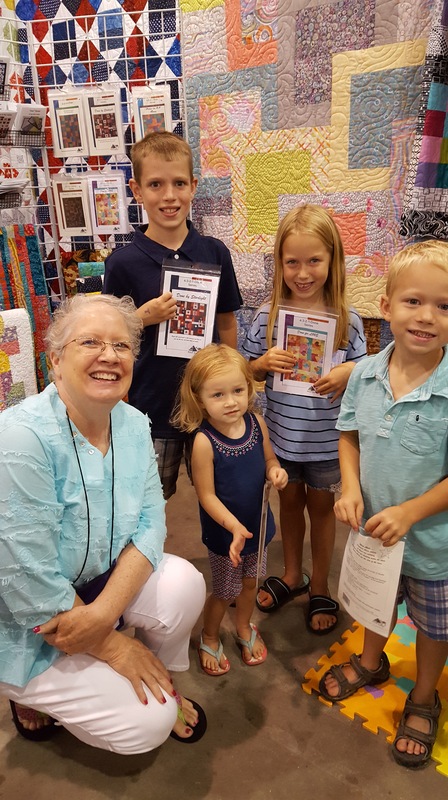 I love hearing your quilt stories and seeing those smiling faces! Speaking of smiling faces, look at this crew below. I had some happy children leaving my booth. I LOVE to encourage young sewers/quilters! This family was a joy to meet and hear about how they all are sewing on their own or on the lap of an adult. Happy kids with a new pattern for each of them! 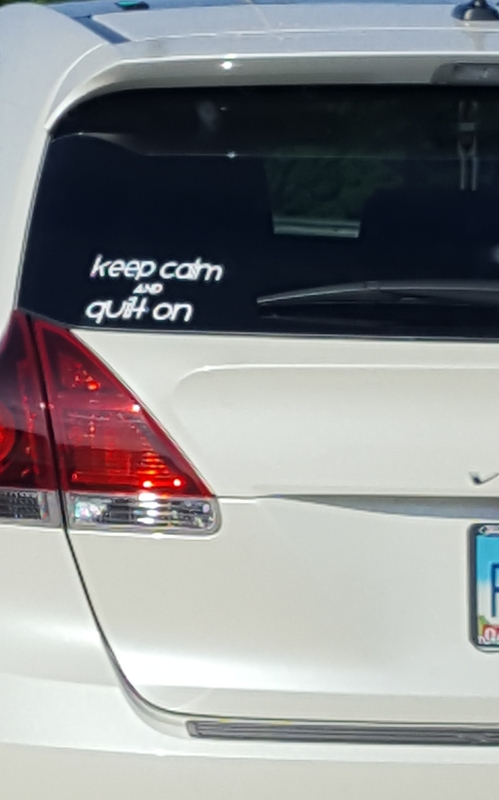 And on the trip to GR, the best sticker was on the car right in front of me at a stop light in the middle of Ohio! Grand Rapids…you are truely GRAND!! #1- Introduce the next generation to sewing and quilting! #2- Shout it from the rooftop (or back of your car). I’m a quilter and proud of it! As a former Home Ec teacher I feel it is so important to get young people the “basic needs” skills. Sewing is one of those skills. Whether sewing on a button, hemming a pair of pants, attaching a scout badge, mending a hole in pants (OH wait, some pay big bucks for ripped clothing 😉 ). But, I hope you catch my drift! My next show is Fall Paducah in just three weeks. I hope to see some of you there. My “Become a Brilliant Binder” class is sold out but you can get on the waiting list. And there are still some seats left in “Trapunto Basics on Your Home Machine”. Won’t you come and join me?!? My booth will be on the second floor in the convention center building. I’ll post my booth number soon. I’ll see you next week back at the sewing machine for more tips! And don’t forget to head over to the Teal Mini Swap if you haven’t done so already. The 29th is the last day to sign up. For a great cause of fighting ovarian cancer. This entry was posted in Brilliant Bindings, Patterns, Quilt shows, Teal Mini Swap, Uncategorized. Bookmark the permalink.